I mentioned the other day that I was working on some changes to the site. Well, the good news is that they’re pretty much complete. The biggest change is that I’m moving from WordPress to Blogger to host this blog. So what does this mean? For most of you, it means nothing. If you want to continue reading this blog (which I hope you do! ), keep returning to www.Dollarsavingdiva.com. Those who will be affected are the subscribers to this blog. Because the subscription is through WordPress, it won’t continue anymore. BUT, if you want to continue subscribing (which again, I hope you do! ), you can subscribe through Blogger. Just go to www.Dollarsavingdiva.com and click on the subscribe button. Sorry for the low frequency of my posts lately, but I have been doing some work on the site and have been trying to limit the new content. Don’t worry though, DSD will return in full swing soon enough!! However, I couldn’t not make sure that everyone knows about all the sales going on right now (sorry about the double negative). The end of January/early February seems to be the time where the stores start clearing out their winter inventory to make room for spring!!!!!! (I’m so tired of this winter… spring can’t come soon enough!). This means major discounts. For instance, yesterday, I found an amazing black DVF cocktail dress on sale at Bloomingdale’s (unfortunately I can’t find a picture of it). Originally $445, it was reduced to $268. All sale items in Bloomie’s are 50% right now, so I used my amazing math skills to calculate the final price to be $134, and I was pretty stoked about that price. But when the salesperson rang my dress up, it came out to $77!! My mouth dropped open. I don’t know where that discount came from, but I’m certainly not going to complain! That’s even better than sample sale pricing! The sales aren’t limited to Bloomingdale’s. I stopped in Lord & Taylor and Macy’s on Saturday, and sales abounded. If you’re looking for deals on jewelry (if I have any male readers, Valentine’s Day is just around the corner! ), I would check out Macy’s ASAP because they are hosting a huge jewelry sale! I haven’t been to Saks or Bergdorf lately, but I would venture to guess that you can score some good deals there as well. So go shopping!!!! You don’t want to miss out on these deals! In light of the most recent snowstorm to hit NYC this winter (what’s up with the weather this year?? ), I thought it would be a good time to further reminisce about being in Hawaii. As promised, I’m going to give you some tips on how to score good deals while vacationing. I’m also going to give you some “don’ts” so you don’t make the same mistakes I did. 1. This is an absolute “DO”– get a guidebook before you go on vacation. They are soooo helpful and really give you an insight into wherever you’re traveling that you wouldn’t have otherwise. Also, it will give you recommendations for restaurants, tour companies, excursions, etc. I will usually do some research as to what are the best books for a particular location, but in general I really like the Let’s Go series for Europe, and will use Fodor’s for other places as my default if I can’t find any clear book winner. For Hawaii, I heard unequivocal praise for the Hawaii guidebooks from Wizard Publications (which I had never heard of before). I will usually check these books out of the library prior to my trip. However, the NYPL actually does not carry Wizard’s The Ultimate Kauai Guidebook, so I went out and purchased it (using a 20% off coupon at Barnes & Noble!). I would HIGHLY recommend this book if you ever go to Hawaii (there’s a different book for each island). 2. The next tip is pretty obvious and goes hand in hand with my previous tip. Research and plan beforehand. When I’m doing a vacation involving a lot of sight-seeing, I like to have at least a rough idea of the things I want to see and do. I won’t make a structured itinerary–I like to leave some flexibility– but I want to make sure that I’ll have time to do everything I had hoped to. Another benefit of researching beforehand is that you may actually save money! 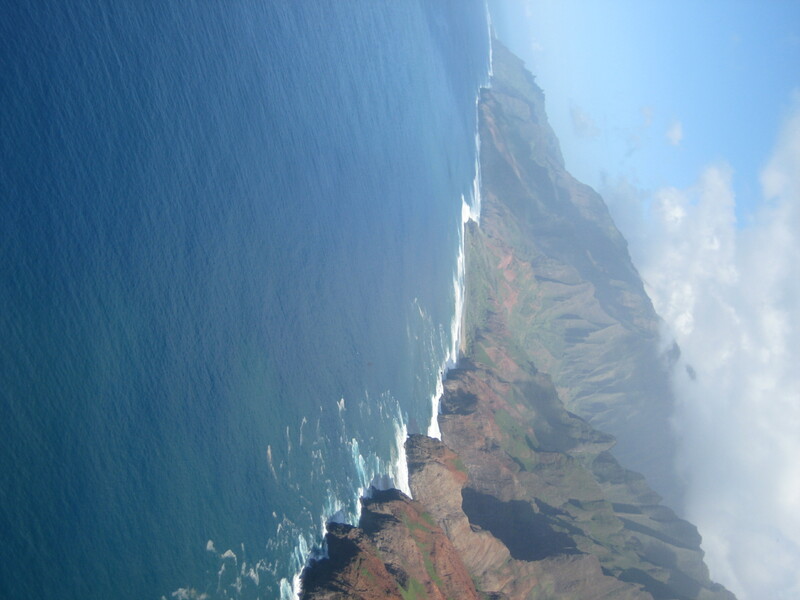 For instance, my boyfriend and I decided to take a helicopter tour of Kauai. We decided on one particular tour company that seemed to be the most reputable. When I looked on their website, I saw the price was $229 per person. I called the company and asked about discounts and learned that the only available discount was for AAA members. So I did a little more digging online, and found a Maui-based tour company, Tom Barefoot’s Tours that was offering discounted reservations. I wound up booking through Tom Barefoot, and we paid $197 per person. While this certainly wasn’t cheap, between the two of us, we wound up saving $64. Hey, it’s something! And for the record, the ride was totally worth the money. View of the Napali Coast from the helicopter. The picture does NOT do it justice! Anyway, this post is much longer than I anticipated. But I still have a few more tips so stay tuned for one last post on my vacation money-saving tips! Well, I’m back from Hawaii! Thanks to NY for welcoming me with freezing temperatures. It’s sooo great to be back! My trip was fantastic–we spent 9 nights in Honolulu and Kauai, and had a wonderful time. Of course, just because I left NY behind, doesn’t mean that I left my dollar-saving ways behind too. In fact, I’m happy to report that while the trip was by no means cheap, I was able to score quite a few discounts, saving us a significant amount of money. I’m going to share some of the tips and tricks I used to get the deals I found, so that you can save some dollars on your next trip! One of the biggest savings that I got came from Priceline.com. Believe it or not, I had never used the “Name Your Own Price” feature on the website, but I wound up using it twice for this trip. And I can’t wait to use it again!!! I used Priceline for our hotel in Kauai, as well as for our rental car there. Because we went to Hawaii during the rainy season, I was afraid of bad weather and wanted to do everything I could to ensure the best possible weather. For that reason, I decided to stay on the South Shore of Kauai, in Poipu Beach, because it was supposed to be sunnier and drier than the island’s other major resort areas. I wanted to stay in a 4 or 5 star resort, and there were only two in that part of Kauai–the Sheraton and Grand Hyatt. At close to $500 per night, the Grand Hyatt was out of our budget, so I decided to stay at the Sheraton with a base rate of about $230 per night. I monitored Sheraton’s website and found a deal for 35% off the nightly rate with the 5th night free. This was by far the best deal I found for it, coming in with a base rate of about $175 per night. I was very happy with this rate, but wanted to see if I could do better. (Also, I was kind of salivating over the Hyatt). So I decided to check out Priceline. And I’m glad I did! I had never used Priceline before because I was afraid to relinquish control over what hotel I’d be staying in. But I didn’t realize that you can choose hotels by star level and by location. I checked out the regular hotel search on Priceline, and the Sheraton and Grand Hyatt were the only 2 hotels that appeared in the location I wanted and in the “resort” category, so I knew that I’d get one of the two. So I went for it, and wound up booking the Sheraton at $135 per night! 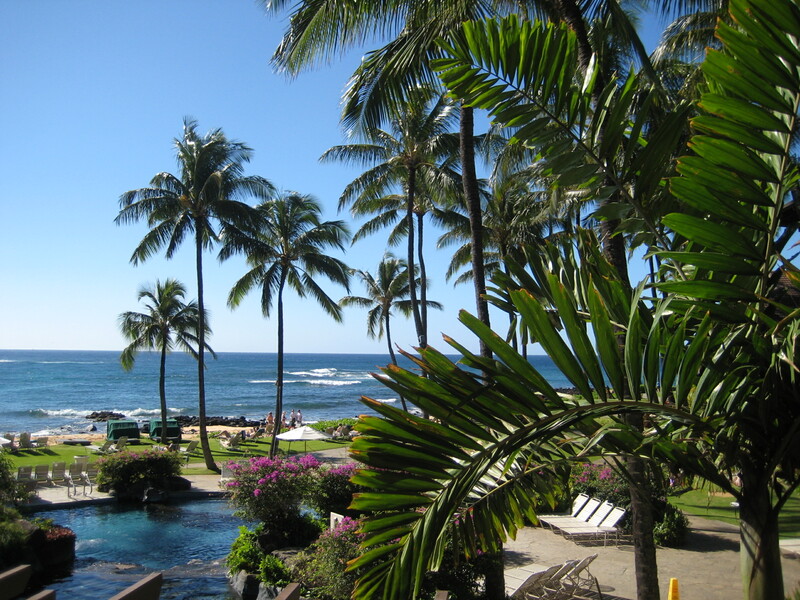 For a beach-front resort in Hawaii, that deal was pretty much unbeatable, and I saved about $40 per night. What made it even better was that the hotel was supposed to undergo a renovation starting 2 days before we were supposed to arrive. The hotel only announced this a few days prior to that date, and as a consolation, it was going to offer its guests free breakfast for the duration of their stay (the buffet was normally about $25 per person). Luckily, the renovation was pushed back until after we were leaving the hotel, but we were still given the breakfast vouchers. Additionally, because the hotel wasn’t at full capacity, we asked for and received an ocean-view room. For $135 a night (plus taxes and the BS “resort fee”). The view from our balcony... I wish I could be there now! The hotel itself was nice, but nothing spectacular. I’m curious to see what it will look like after the renovation. Overall though, it was undoubtedly worth what we paid for it, and even if we had paid the higher price, I wouldn’t have regretted it. Thanks Priceline! I booked a convertible through Priceline as well. The savings were much more modest at about $15 per night, but I think we could’ve gotten a great deal if we had just wanted a normal car. Anyway, the savings did not end with the hotel and car. Stay tuned for some of the other discounts I found as well as my other vacation saving tips! *If you were wondering about the title, Mahalo is “thank you” in Hawaiian. Hey everyone! Sorry I didn’t tell you earlier, but I’m currently vacationing in Hawaii, so Dollar Saving Diva will be on hiatus until I return on January 24 (unless I decide to ditch freezing NYC and just stay here, which is quite possible). So don’t forget to check back after then for more deals in NYC, and I’ll also tell you about some of the tricks I used to make this vacation (somewhat) affordable (and, also what I might have done differently)! Stay tuned!! Waikiki beach, where I'm currently staying. Tomorrow, off to even more beautiful Kauai! New York Magazine’s Sample Sale List is Back! So last week, I complained to you that my go-to site for learning about sample sales hadn’t been updated in quite some time. Well, clearly the editors of NYMag read this blog, because they have finally updated the “Sales and Bargains” section of their website!! Coincidence? I think not! The site, which had previously been updated daily, hadn’t been updated since the end of November, and I had been using poor substitutes to learn about sample sales. Happily, the real thing is back, and I’ll be able to easily stay abreast of the current sales and sample sales in NYC. Welcome back NYMag’s “Sales and Bargains”! Sorry for the lame clip art, but I'm so excited, how could I not celebrate?? For today’s better deal, discounts at Habana Room Cuban restaurant, in Midtown East, are on offer. Restaurant.com is selling $25 gift certificates for $15. However, if you read this post, you know you can buy those certificates at a discount. Currently, there is an 80% off promotion on Restaurant.com, so a $25 certificate would only cost $3 (just use the promo code “SPOON” at checkout). That amounts to a $23 discount (there are also options for $50, $75, and $100 certificates, priced and discounted accordingly). If you buy the $25 cert, the only restriction is that you need to have a minimum purchase of $35. Pretty reasonable. The other discount option is through Scoop St, which is offering a $25 credit for $10. There aren’t any restrictions. But I think in this instance, Restaurant.com is the clear winner. If you want to keep up with my blog, please subscribe!! Just enter your email address and you will receive notifications of new posts by email.